Alto Adige: Why is it also called the Sudtirol? Driving north passed the city of Bolzano, the countryside started to look more German than Italian. Road signs were in two different languages: German and Italian. When we reached the Alois Lageder winery, we were greeted by Urs Vetter the export manager who gave us a tour of the winery and a wine tasting. When it was time for lunch, he said that he knew an excellent restaurant not far away. He called the restaurant and spoke in German. When he looked up and saw the surprised look on our faces he simply said that in the Alto Adige, German is the first language. Located at the foot of the Alps and the Dolomites, the region borders on Austria and Switzerland. The Alps protect it from inclement weather from the North and the Atlantic, while the Dolomites protect the vineyards from the cold, damaging winds from the east. Along with its proximity to the Mediterranean and Lake Garda, this makes it an excellent region to grow grapes. It is interesting to note that in the summer, the temperature in Bolzano is higher than in Palermo in Sicily. The people that live here call their region the Sud Tirol and themselves Tyroleans. The food is decidedly Austrian with only a hint of Italy. Ham is called Speck and they have a cheese called Weinkase Lagrein and bread called Schuttelbrot. 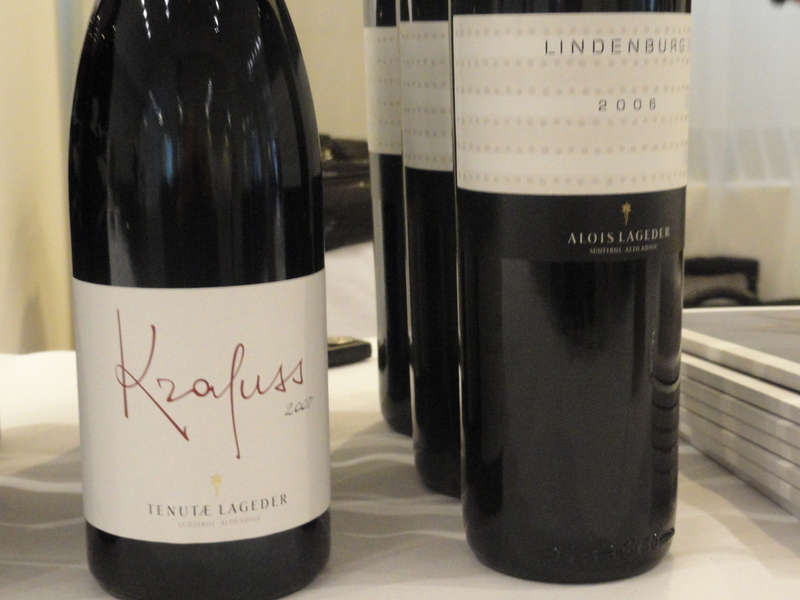 Recently in NYC I was invited to attend a seminar followed by a tasting of the wines of the Alto Adige moderated by Mary Ewing Mulligan, MW (the first American Woman Master of Wine). 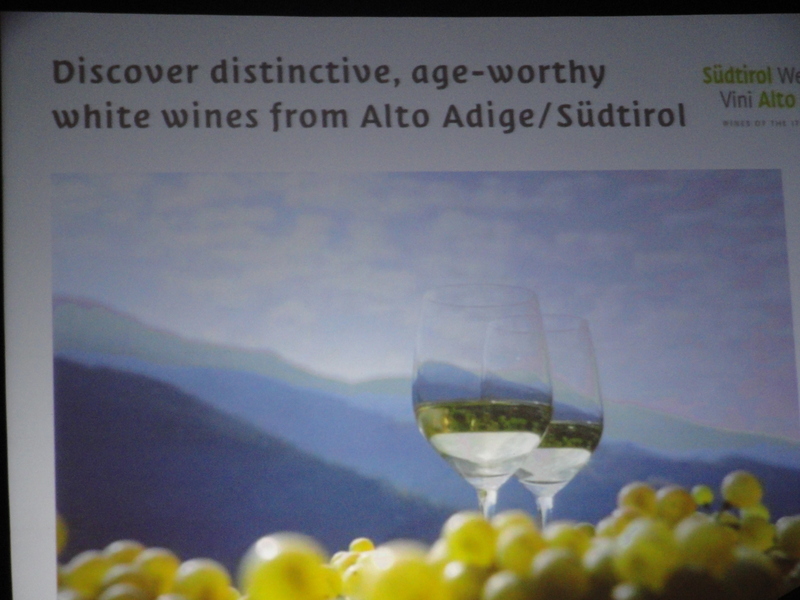 The seminar was entitled “Distinctive White Wines of the Alto Adige” and included eight wines in the tasting. Mary began with a few remarks regarding the enormous range in vineyard altitude and temperature between the southern and northern areas of the Alto Adige which results in a huge diversity of microclimates. She also went on to say that the most important grapes from the area for the American market were: Pinot Bianco, Pinot Grigio, Gewurztraminer, Pinot Noir and Lagrein. 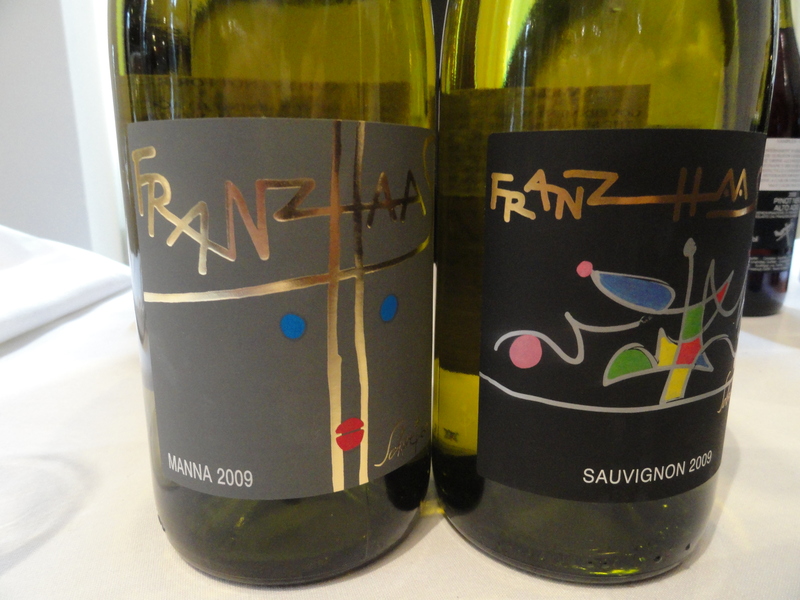 Manna 2004 IGT Dolomiti Franz Hazz made from Chardonnay, Sauvignon Blanc, Reisling and Traminer Aromatico. Because of the different maturing times, the grapes are harvested and worked separately. The Chardonnay and Sauvignon Blanc are fermented in barriques, the Reisling and Traminer Aromatico in stainless steel. The wine does not go through malolatic fermentation. The Traminer Aromatico is late harvest and there is only a small percentage of Sauvignon Blanc .The wines are then blended together and rest on the lees for 10 months and remain in the bottle a few months before release. The speaker for this wine was Tobias Zingerle. Pinot Grigio “Sanc Valentin” 2006 DOC Alto Adige San Michele Appiano 100% Pinot Grigio. This winey is also a cooperative. The grapes come from selected vineyards in the Appiano Monte at an altitude of 450 meters and the wines are 25/40 years old. 40% of the wine is fermented in new barriques and 60% in used ones, where the wine stays on the yeast for 11 months. The speaker for this wine was Wolfgang Klotz. Mr. Klotz is the marketing and sales director. He said that 2006 was the driest vintage in the last ten years and that the berries were very small and concentrated. The wine had a very distinctive aroma that I could not quite place. On the palate it was very mineral. Over all it had more oak and vanilla then I expect from this producer. Sudtiroler Sauvignon Castel Giovanelli 2007 DOC Alto Adige Caldaro 100% Sauvignon Blanc. Castel Giovanelli is 2.5 hectares of vineyards which are bio-dynamically cultivated. There is extreme prolonged pressing of the grapes in their entirety, spontaneous fermentation of the unfiltered juice in 500 liter oak casks. The wine is aged in wood for 12 months, then a light filteration and bottled in August 2008. The speaker for the wine was Tobias Zingerle. He said that the vineyard was an east facing slope of 500 mt above sea level. The soil is loamy, chalky gravel with porphyry and weathered granite, providing a prominent mineral character to the site. This was the most vegetative of the wines with a lot of citrus fruit which I found to be a strange combination. Mr. Zingerle found it less vegetative. Mary commented that this was more of a winemakers wine than a natural fresh wine but did not find it “over worked.” I did. Mary said that the cooperatives in the region were quality-focused and overall the region has the best cooperatives in Italy. A typical cooperative will have several hundred members cultivating a plot that is on average less than 2.5 acres. Fifteen cooperatives produce almost 70% of the regions wine. The remaining 30% is produced by wine estates and independent winegrowers. There was a brief discussion on how well the white wines of the Alto Adige age. 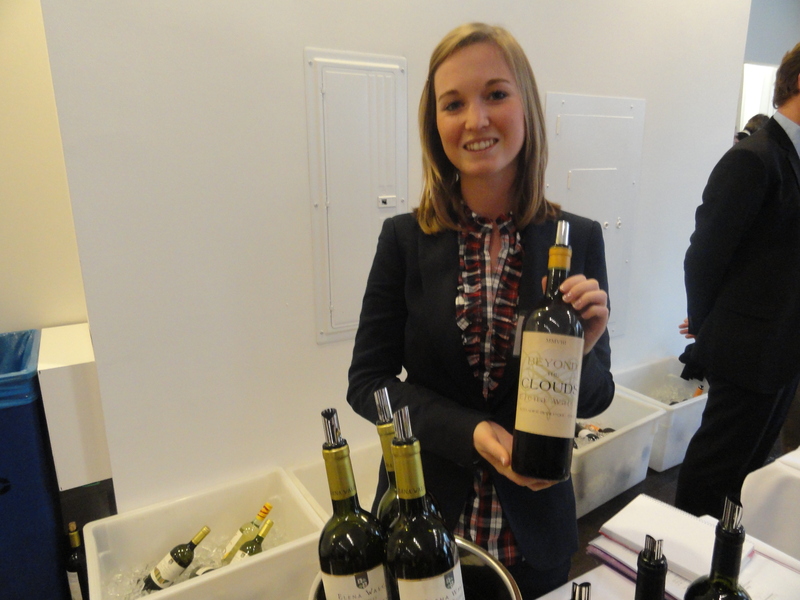 Mary said that she was surprised that the panel members did not chose a Pinot Bianco as part of the seminar. She agreed that the white wines do age but believed that the Pinot Bianco aged the best. She went on the give examples of Pinot Biancos that she had in the past that were 20 and 30 years old and in great condition. This was why she believed that the best place to grow Pinot Bianco was in the Alto Adige. In the walk around tasting here are some of the wines which I found interesting and show the great variety of wines produced in the Alto Adige:Abbazia di Novacella – Kerner 2009, Cantina Bolanzo- Santa Magdalena Pinot Grigio 2010, Franz Hass Moscato Rosso 2009, Alois Lageder Muller Thurgau 2010, St Michele Appiano Sauvignon Sanct Valentine 2009, Elena Walch Beyond the Clouds 2008 and Schiava 2009, Peter Zimmer Lagrein 2009 , Manincor Moscato Giallo 2009 Tiefenbrunner Pinot Nero Turmhof 2009 and the Pinot Bianco 2009 and the Nussbaumer Gewurztraminer 2009 from Tramin. I finally made to Alto Adige for four cold, rainy days last May (only the morning we left did the sun come out). 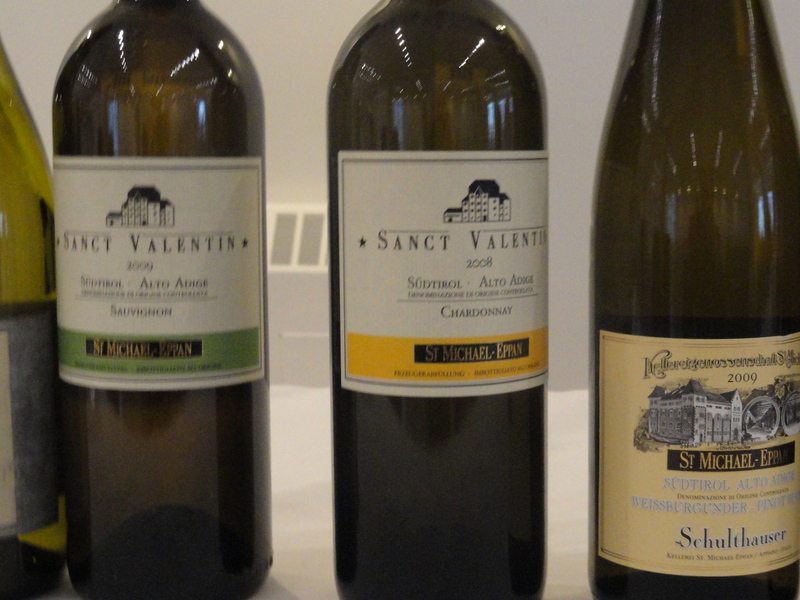 I tasted the Sanct Valentin wines at their winery; I’ve loved their Sauvignon and Gewurztraminer for years. 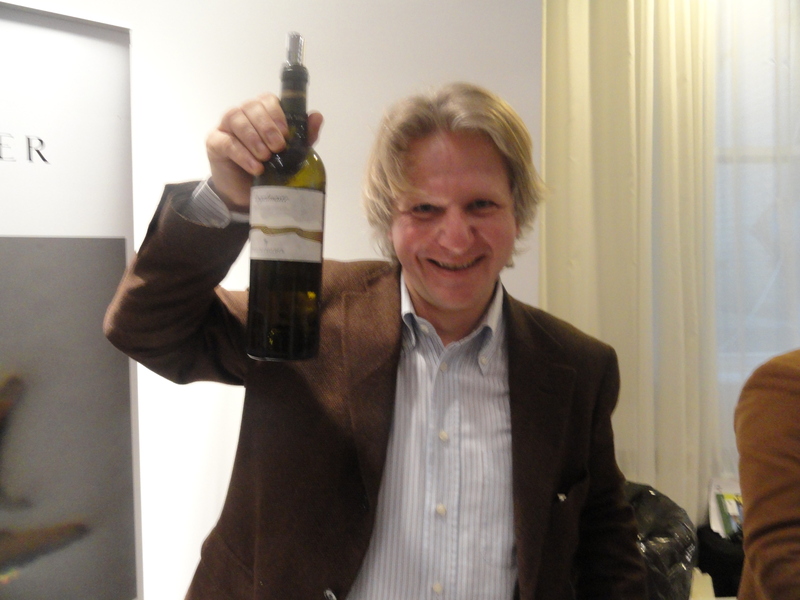 We also spent five great hours with Markus, the winemaker at J. Hofstätter. 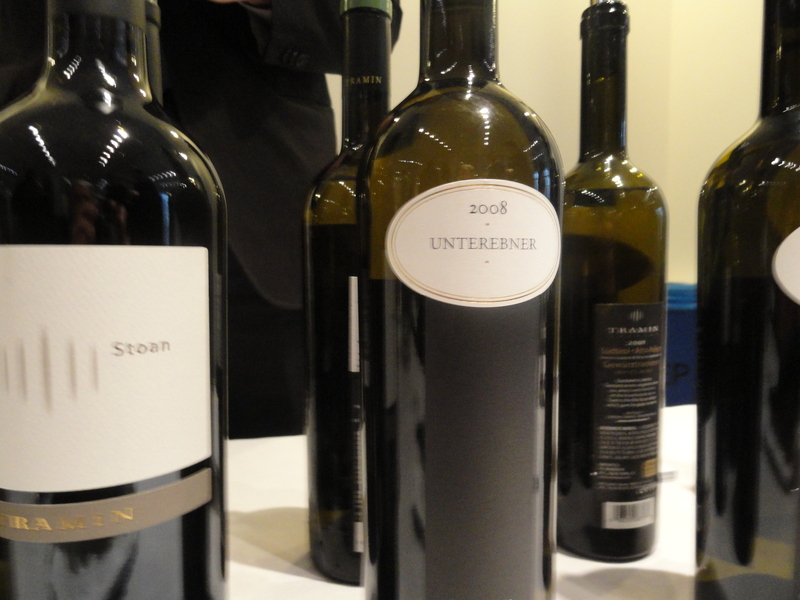 The highlight was doing a vertical of the great Steinraffler Lagrein; concluding (to me) that about 15 years of aging is what is needed for this, one of Italy’s greatest wines. Btw, what’s great about this area is that wine prices in restaurants are closer to retail than double retail.